If you’ve not been to the Grand Pacific on King Street, Manchester, then you’re missing out! The 1st floor restaurant, lounge and bar is seriously stunning and oozes cool. The building is beautiful, with floor to ceiling windows, high ceilings and the opulent interior and golden pineapples are serious insta-fodder! The place has definitely got the wow-factor when you walk in. The main menu at Grand Pacific is an eclectic mix of asian fusion dishes and is seriously impressive, so I couldn’t wait to see what the High Tea had in store for us. I enjoyed the Grand Pacific High Tea with two of my favourite blogging gals, Kat and Danielle and the service was great from the moment we set foot through the doors – the right balance of informal, yet special. We were offered drinks on arrival whilst we perused the High Tea menu and were explained that we’d enjoy a glass of bubbles first, then we’d choose our tea, which we’d enjoy with the first selection of savoury goodies and then the second selection of sweet treats. TREAT YOUR TASTE BUDS TO A SELECTION OF GOURMET SAVOURY TREATS. INDULGE YOUR SWEET TOOTH, WITH FLAVOURS OF THE EXOTIC & MEMORIES OF HOME. ALL SUPPLIED BY TEA FROM THE MANOR. As you can see from the menu, it’s not your average high tea! It’s something quite different and quite delicious, I can assure you. 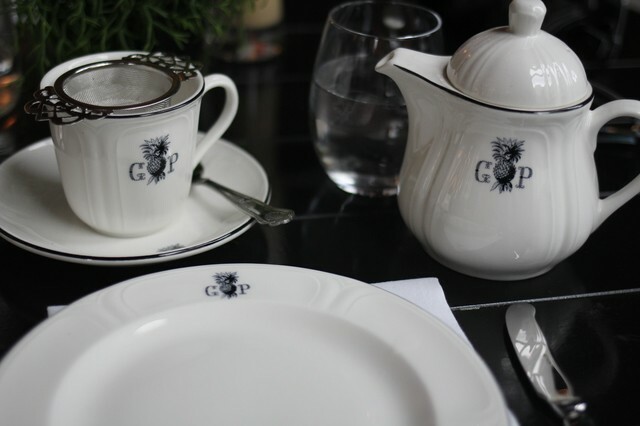 At £22 per person, or a touch more if you go for the Prosecco/Champagne options, I think you certainly get good value for money with the Grand Pacific High Tea – it feels special, it feels like a treat and it’s certainly unique. We happily chit-chatted 2 hours away and it’s a perfect afternoon activity for the girls or a treat for mum. I also love that they have a selection of Prosecco infused teas! What’s not going to be good about that?! My one slight critique would be that it did feel slightly strange having high tea without the usual scones, cream and jam. The pastries and sweet treats were fab, but I did find that I missed a scone…even a twist on your traditional scone would have been fun. But you certainly don’t go hungry without it! Where’s your favourite place for Afternoon or High Tea?